Its been a long i wanted to try this banana & orange combo in juice, finally i tried this beautiful combination of my two favourite fruits a day back, a super refreshing and fantastic juice to enjoy without any hesitation. Paris climate is very much hot nowadays and we are literally running behind chilled foods and drinks. With loads of ice cubes,we simply enjoyed having this healthy and sugarless juice as i used agave syrup.Sending this healthy juice to my own event Healthy Diet-Healthy juice guest hosted by Kiran. Blend the banana with chilled water and agave syrup as smooth paste, add finally the fresh orange juice, give a stir. The combo sounds so different ..looks delicious..
Yummy and delicious juice. Great combination. Looks delicious. Can do with a glass or too here its tooo hot. super yummy !! !.Join me in Fast Food event - Noodles. Une combinaison que je n'ai jamais testée. Cela donne très envie. Banana and Orange is a very new combo to me :) I've been giving my son Apple+carrot juice or Watermelon+carrot juice lately . This is definitely something I can try as he's really getting bored of eating bananas n i'm sure a drink wud be a good choice. Good one Priya! Never tasted this combo..will surely try it out sometime. Delicious combo of bannana and orange. lovely color Priya. such a refreshing combination... a great kick start to the day! 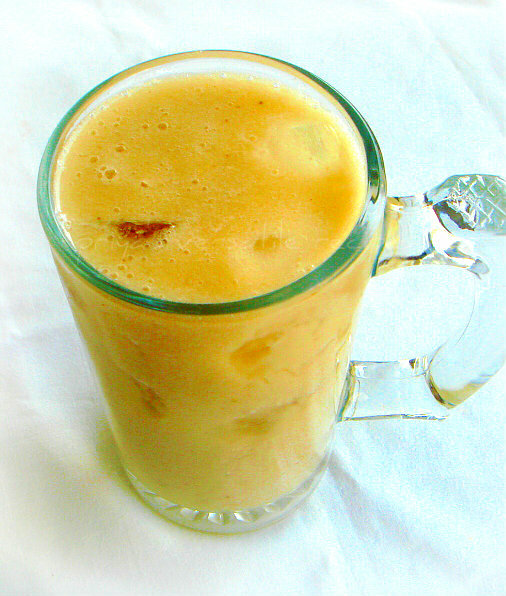 Refreshing drink...banana and orange sounds a yummy combo..
That's a suspense combo Priya...Yummy.